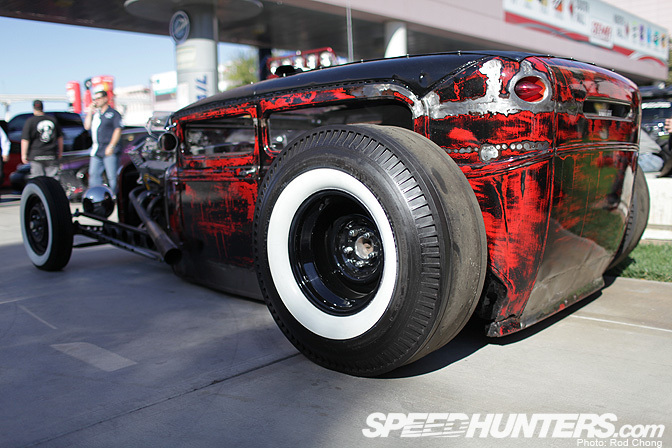 Next up on the SEMA menu, Hot Rods and Customs. 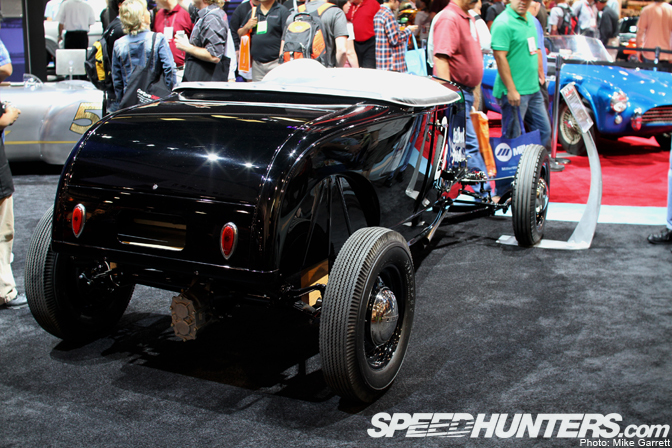 Here are some of the sweet vintage rides we've spotted so far while wandering through show. 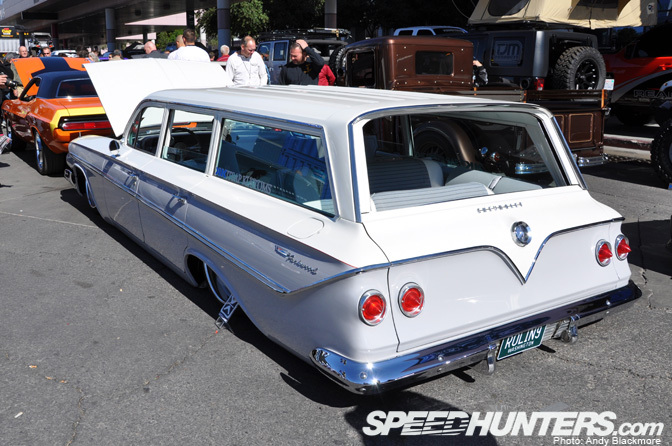 The Bel Air wagon you see here is done a period lowrider style. A style that includes some very intricate paintwork on the hood and roof. … and is absolutely minty clean throughout. 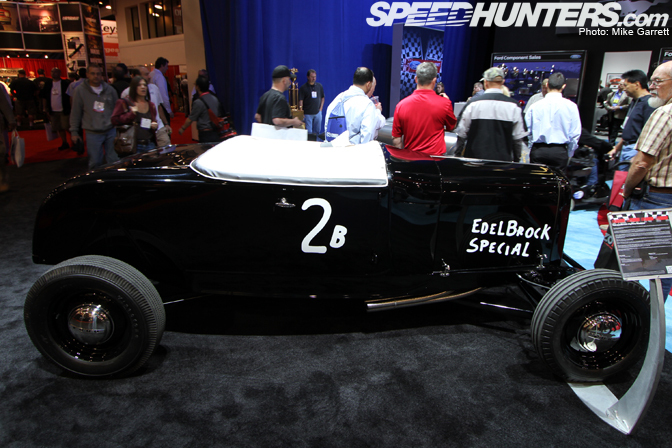 Ford has a piece of Hot Rodding history in its booth with the Edelbrock Special. 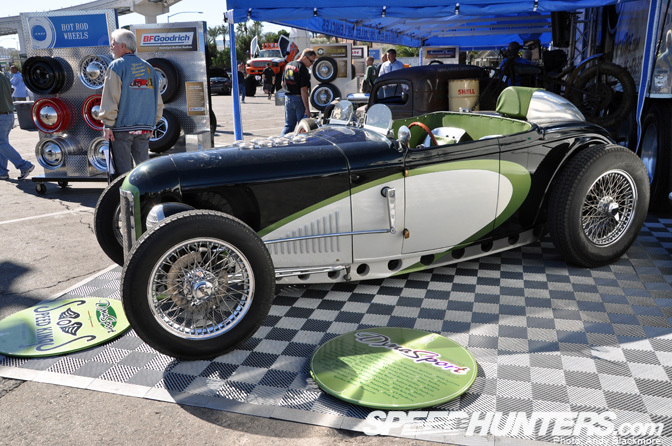 This historic Highboy Roadster has been fully restored to look as it did in 1951, when it made records with a top speed of 153mph. 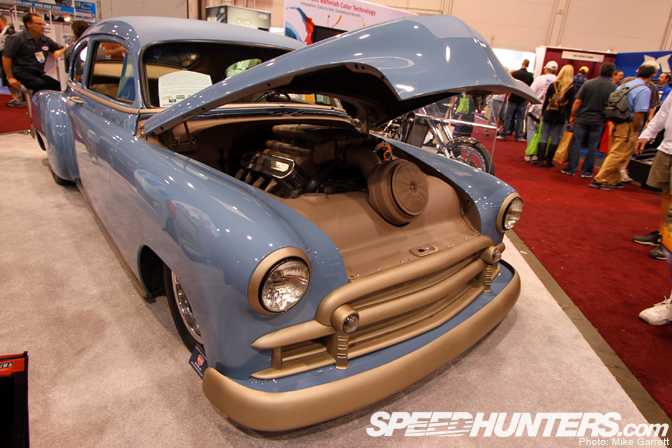 Found in the Dupoint booth, we have a contemporary-styled '50 Chevy that made the SEMA journey from Tennessee. 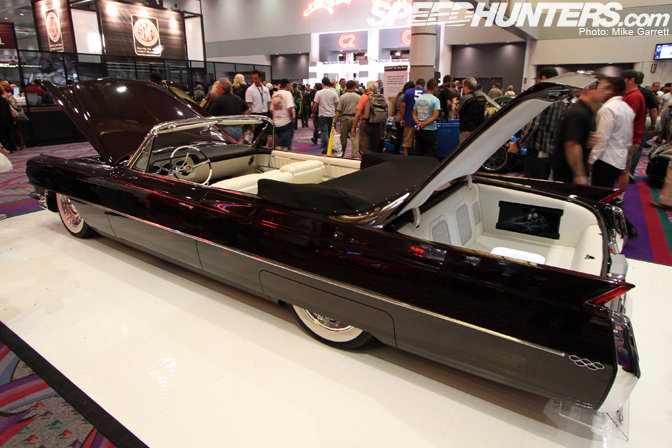 This long and low Caddy convertible was getting a lot of attention outside the entrance to the Central Hall. interested to see more of this car? 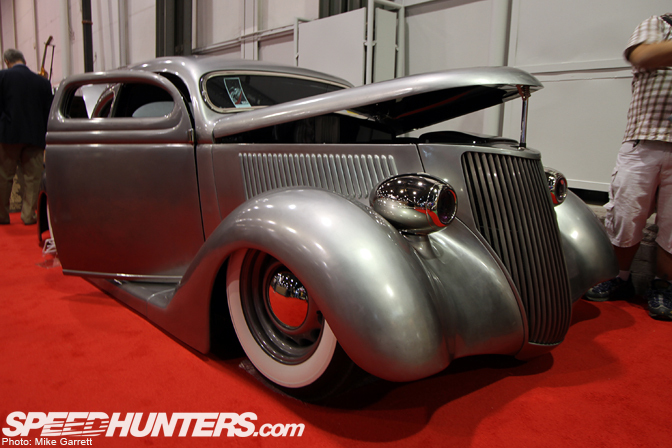 Blue Collar Customs out of Sacramento brought out their impressive '36 Ford Coupe. I need to head up there and pay these guys a visit soon! 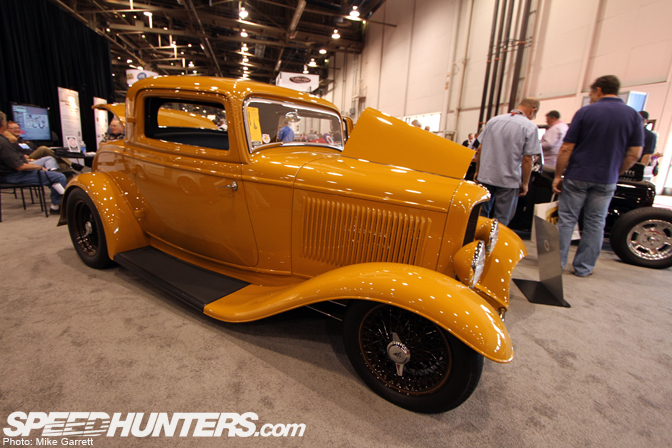 A very clean and very mild '33 Ford. This one's out of Iowa. I thought this '54 Pontiac was pretty cool. 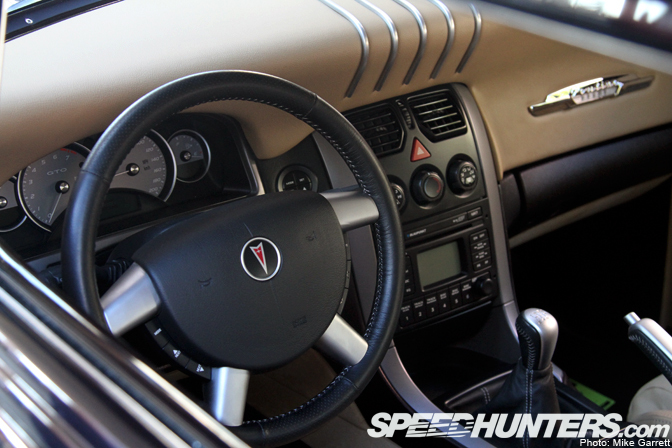 Most of the interior parts come from a late model Pontiac GTO (AKA Holden Monaro). As does the LS2 engine, with a supercharger thrown in for good measure. Another one of those glorious Caddies. If I ever got one of these cars I'm pretty sure I'd have to build a new garage for it to fit in. 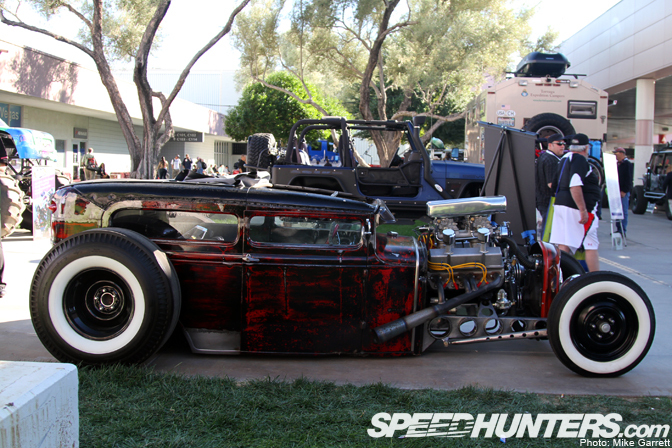 "Rat Rods" always get a lot of attention at SEMA. This one was no different. Rod is planning a quick spotlight on this one… he mentioned it's one of his picks of the show. 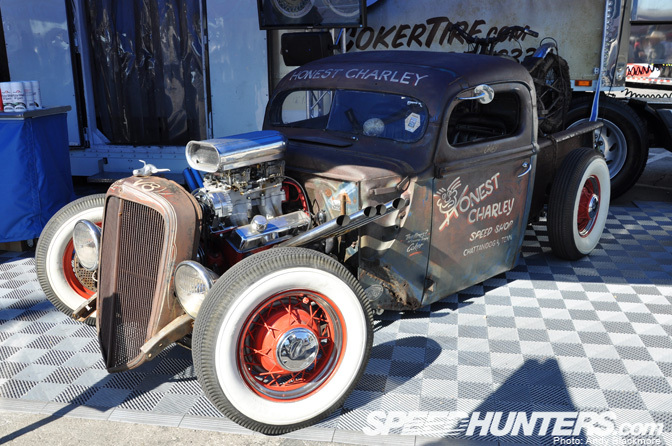 This cool Rat from legendary shop ‘Honest Charley’ in Tennessee was drawing the crowds on the Coker Tire stand. 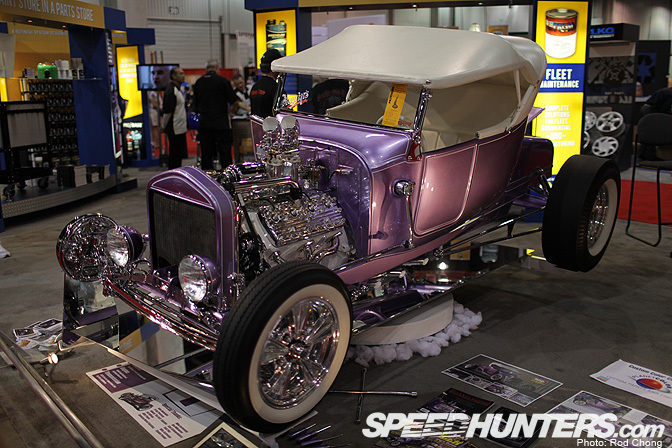 Next door, was this ’32 Ford Roadster by Speedkings, which has been at SEMA before, but you never get bored with such beauties. 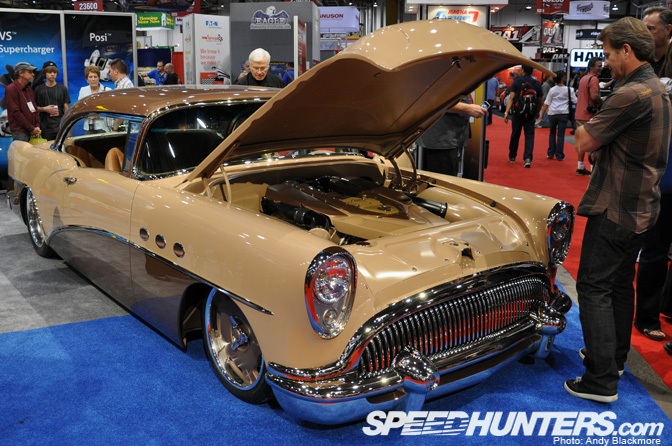 Troy Trepanier’s latest project is this stunning 1954 Buick. Underneath is a 2007 Mercedes G55 powertrain and an Art Morrison custom chassis. 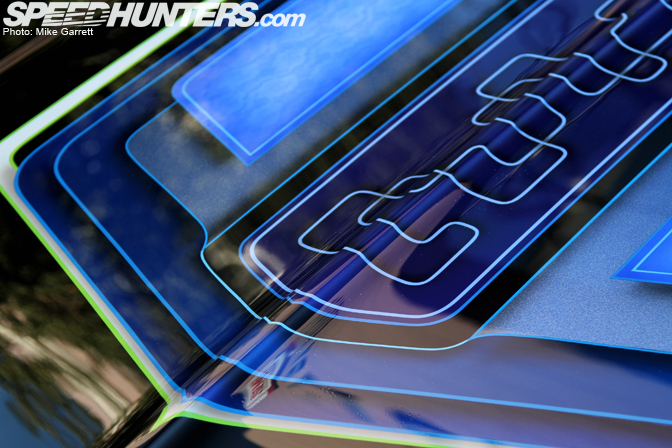 Amazing attention to detail on this car, just as expect from Rad Rides. 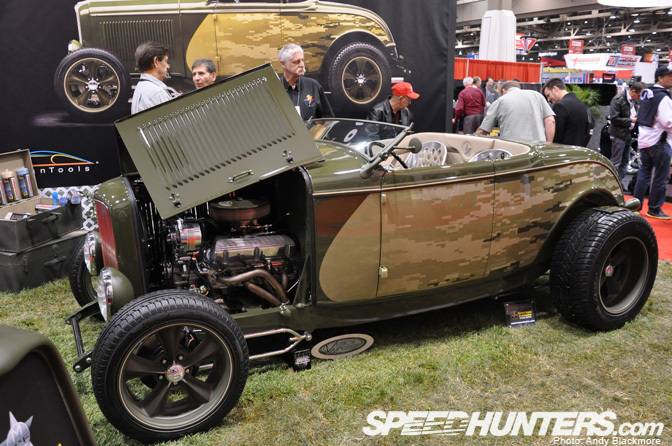 This 1932 Ford Roadster was built to honor America’s war heroes. ‘Medal of Honor’ has some interesting pixel camo not normally seen on a Roadster. This car will be auctioned for Charity at Barret-Jackson next year. Unfortunately, this Chevrolet Parkwood was parked up close to other cars, so many people will have passed by this low rider. There were quite a few Wagons at the show. 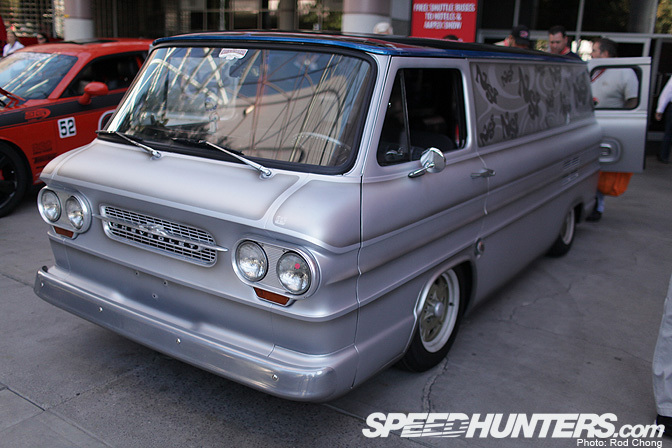 This Corvair van was an interesting choice to build on. 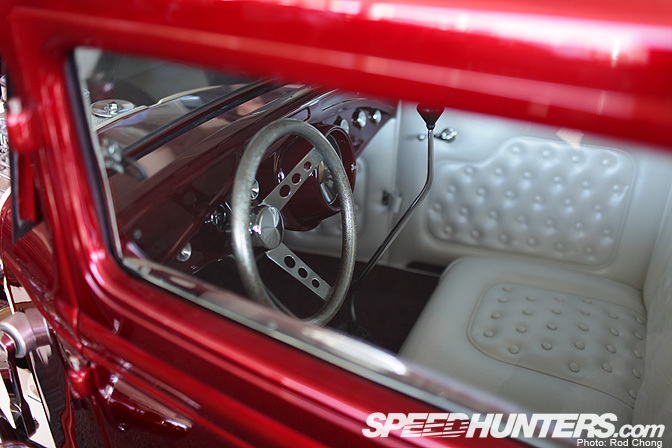 It sported a complete hot rod photo gallery inside. 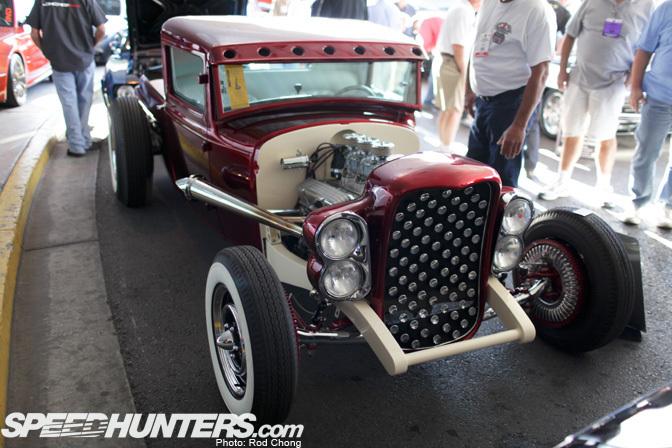 We loved this red and white custom styled pickup. 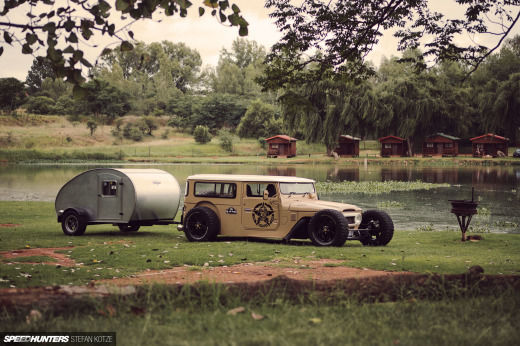 The Takeout T is featured in the current issue of The Rodders Journal. It's cool to see a period correct '60s style show rod in the flesh! That does it for now. Much more to come from SEMA! Great coverage!... I would love to see more of Troy Trepaniers new build, that car looks amazing, and not one of his builds has dissapointed yet. Keep up the coverage, I can't wait to see more. Interested in more of that convertible Caddy? Dear my, YES!!! That car just made the entire VW scene look like a WRC event..
Coverage is awesome, that's a 58 Chevy Nomad Wagon, not a 56. More Caddys please!! Wow! Nice selection of cars. 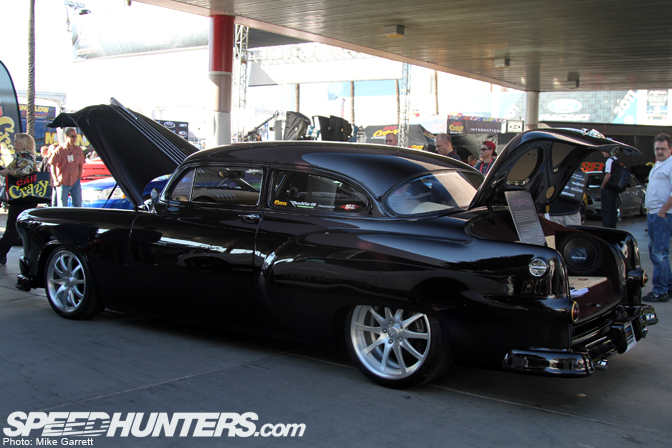 The first wagon is nicely detailed, the first black Cadillac has an immaculate paint job.. Even from the photos it has a mad amount of reflection, black rarely captures so well in an outdoor unprepared setting, testament to the quality of the paintjob. The Pontiac interior and engine bay lead me to believe it probably has more than just parts swapped into the old body, I'm guessing the GTO gave up its chassis for the build? The orange rod is a 32 three window not a 33. Thanks for the pics! Pleeeeeeeeeaaaaaaase, gimme more of that Caddy convertible!!! I desperately need it. sorry but i think the 54 poncho is a waste of a beautiful 54 body. Im all for to each their own, but but good taste has to prevail over the "just because i can" moves. 4 ex i like pro tourers when done right, but will never understand a custom w/ big inch wheels and modern interiors, i think street rods are bad enuff already. and i really am a very open minded guy, i like the oddest of things. Ready to see that caddy feature mike! Thing is viscous ! 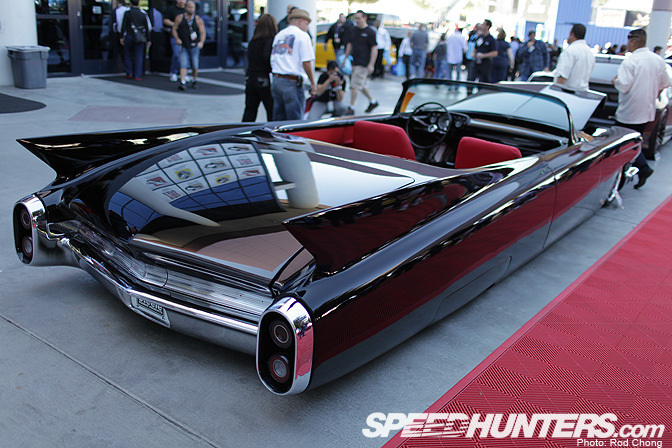 Definitely want more of the Caddy convertible. That's a 32 Ford out of Iowa, not a 33. More of the caddys please!!!!!!!!! 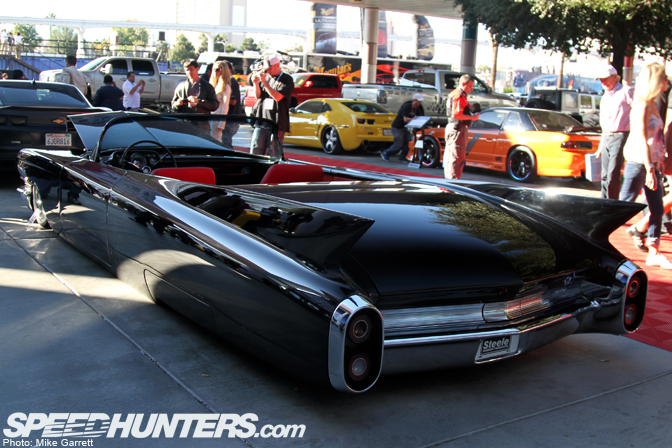 Great coverage, I love the wide variety of cars at SEMA. Thanks for giving us a taste of some of the different styles. In case it wasn't pointed out already, the fendered orange Ford is a '32 and the double headlights on the green Chevy wagon means it's a '58 (only year chevy offered double lights). Nomad wagons were typically two door models and the green one looks more like a Brookwood, but I've been wrong before. honestly, Honest Charley is killing it with that pickup, but that first Bel Air is AMAZING!!! I love the old school lowrider paint jobs. Im a tuner guy and absolutely love these cars, great builds and great quality went into just one of those cars. true about the 58 wagon. Not a Nomad. Nomads are only 55 to 57, and were 2 door only, but not to confuse with the tudor wagons, diffrent cars, nomads had unique roof/rear glass designs. TROY's build's are faultless. And yes. More Caddy! 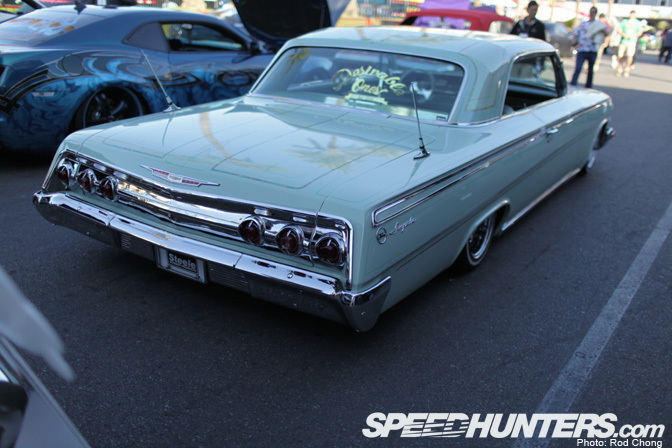 I saw exactly one true lowrider (Desirable Ones) '62 Impala.... The title of this post includes the word "Lowriders"? 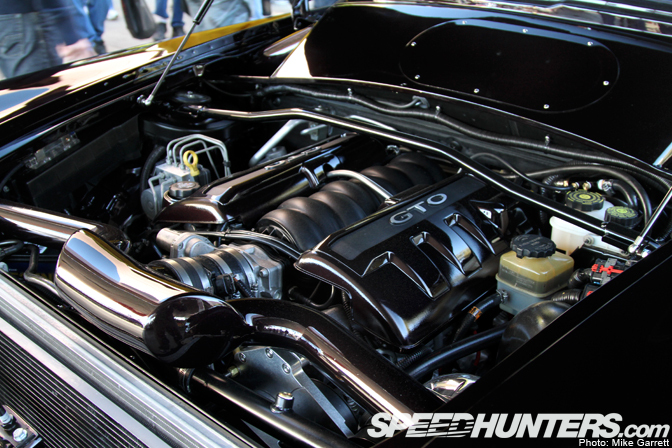 Im pretty sure there isnt a super charger on the on the 54 pontiac it looks like just a custom cold air intake. saw that sweet 65 Bel Air Wagon up close and personal out in the parking lot and it is one sweet build. 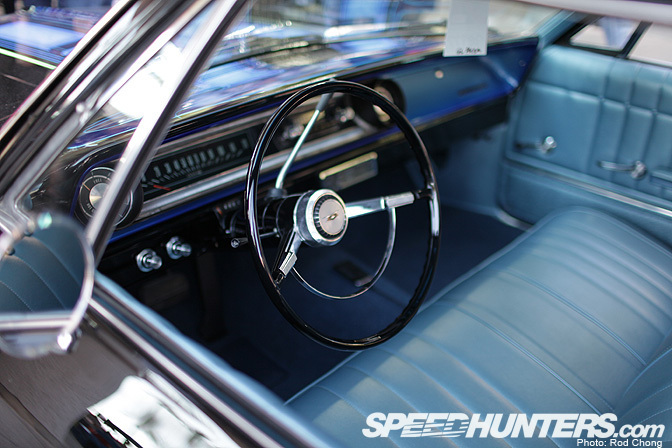 paint is awesome and the interior is killer... props to Crown Works Garage. that 50's Buick is sick. I love it when they mix the classic with the modern goodies..